Let us help monitor and manage your fleet better, with our easy-to-use software platform and locally based support team. Want complete visibility of your fleet? When your fleet is on the road, it can be hard to monitor every detail and stay on top of your business operations. With real-time location of all connected devices, you can maintain control of your business assets, better manage your on-road fleet and gain complete visibility when it comes to performance and everyday use. Save time on collating, reviewing and analysing historical work performance and unreliable data. 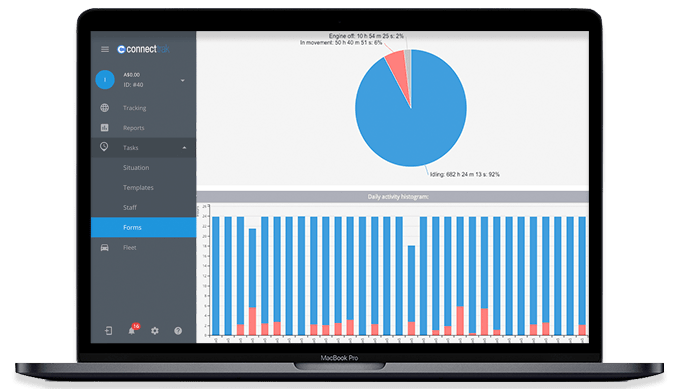 Our software will automatically generate and analyse accurate data to optimise your operations, reduce unnecessary driving, stop expensive downtime, monitor maintenance and increase productivity when it comes to your team. With our software you can activate a number of driver behaviour alerts to ensure your employees are performing at their best, and taking care of your business assets while they are on the road. 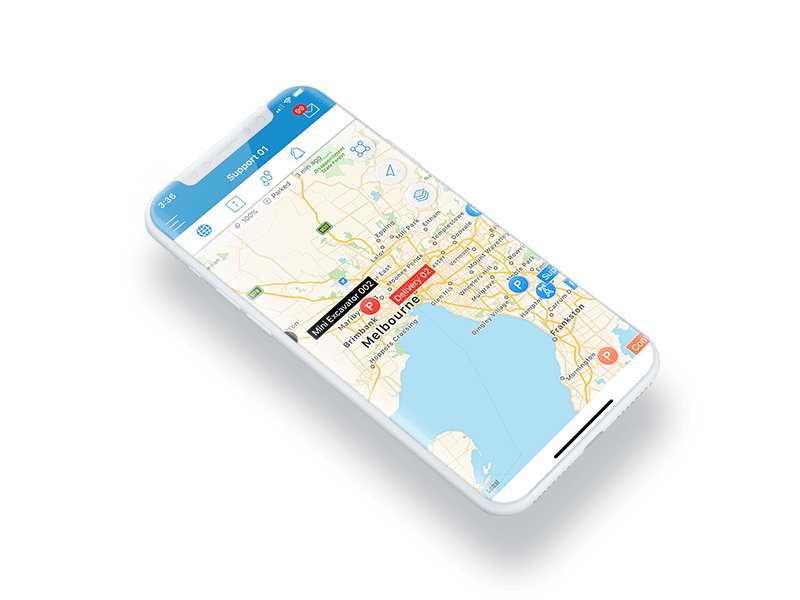 With real-time GPS tracking, you can see your team members live locations, understand driving habits and be alerted to accidents and critical events. 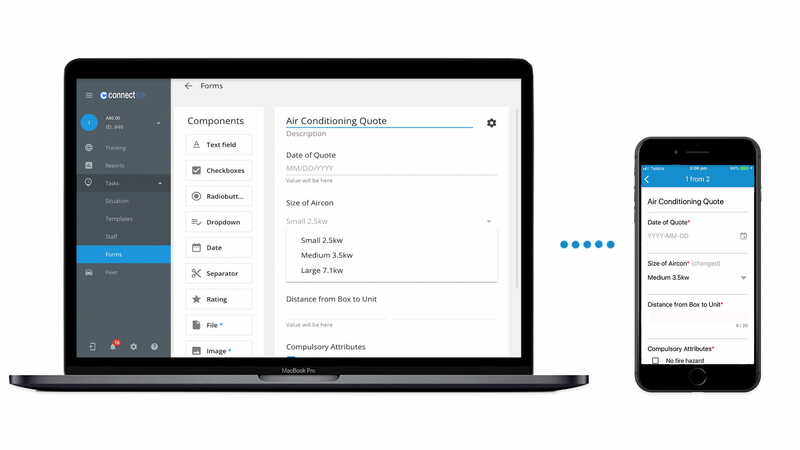 Our simple and practical user interface makes our software platform easy-to-use and quick to learn. Feel confident to manage your fleet from our all-inclusive platform, and work efficiently with everything you need in the one place. Book your demo and see in 15 minutes how we can benefit your business. 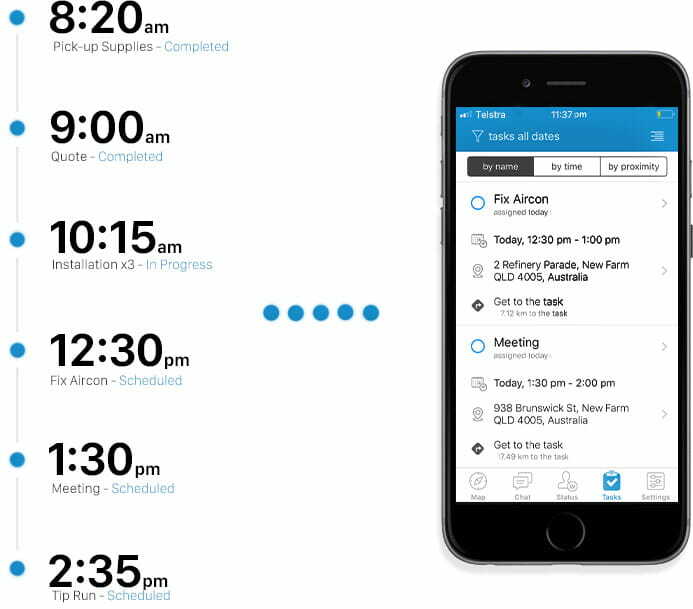 Work more efficiently with our clever feature of scheduling and allocating tasks to staff, and notify them directly via our mobile app. With the ability to include all the information they need, such as requests and directions, you’ll spend less time on the phone and more time on your business. Avoid lost paperwork and move your business digital with our online forms. Our software allows you to customise the information on each of your work orders, to ensure you collect the relevant information needed. Capture site photos, details and customer signatures all on the go. When you’ve got employees, vehicles and equipment in the field, make certain you have the best tracking software in place to ensure you keep everything and everyone, on track! Our software incorporates job scheduling and live status updates, so you never miss a beat and the team as a whole can work more efficiently. When it comes to your valuable assets, benefit from predictive maintenance alerts based on engine hours, kilometres travelled, approaching service intervals and date-based parameters. Using our custom fleet management reporting options, identify and track your asset usage to assist your business with more accurate billing, management of payroll and forecast project costs accordingly. Using our software you can manage your business fuel costs by monitoring kilometers travelled, idling time vs work time, restrict unauthorised use of your business assets and much more. Can I see a demo before I commit? Yes. We encourage you to book in for a demo and take a live tour of our software with one of our solutions experts. To start the process, one of our team members will call you to ask a few standard questions and better understand your requirements. We then tailor the demonstration to suit your specific needs, industry, fleet type etc. We offer $0 payment upfront, with flexible and tailored rental plans for any size business. Am I covered with warranty? For businesses who choose one of our flexible rental plans, we offer warranty for the entire life of that rental agreement. As many as you need! We offer unlimited users access on our software platform. We pride ourselves on creating a simple and easy-to-use software platform, that is quick to learn. Feel confident to run your fleet with everything you need, from our all-inclusive platform. Can I track my trailer? You sure can! We offer a broad range of devices which means you can track just about anything! Our software can track non-powered assets such as trailers, toilets and shipping containers. Can I track assets via my iphone? Our software is cloud-based, which means you can track your assets from anywhere in the world. We also offer a mobile app which allows you to track your fleet from any device be it a desktop, laptop or phone. Login and find your fleet from the palm of your hand. What benefits does GPS tracking offer to me? A GPS tracking solution is a beneficial solution for any business with valuable assets. 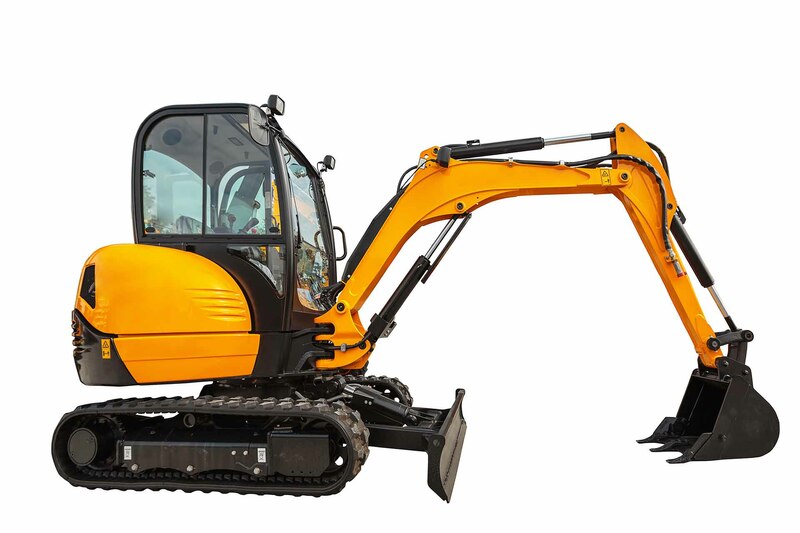 It allows users to track assets such as heavy machinery and equipment, company vehicles or non-powered valuables such as trailers and shipping containers, and remain completely in control to optimise business operations. What makes Connect Fleet different from other fleet tracking companies? Connect Fleet has a lot of offerings hat set us apart from the rest, but here are our top three! 1.We offer a wide range of devices, with over 800 pieces of GPS hardware, that we can integrate for your business to provide a highly tailored and flexible approach. 2.Customer care is our number one priority and no matter how big we may grow as a business, we believe in keeping our customers feeling supported and happy.